I´ve seen alot of renders these days of some Spheres with a fancy IOR material: " The render is small, grainy and I had to stop it after 90 hours, but hey!. It´s physically correct!" Great render Jeremy. Some of the fruits are a bit glossy for my liking, but the light, texturing and cloth are spot on. To to me it has this “overcast sky/daylight light coming in the window” feeling. If that´s what you tried to do, I think you nailed it. Thanks for your reply - it came just as I was replying to another post. Yeah, I’m hoping for that job; a few days ago I heard I might be working for Disney, of all people! 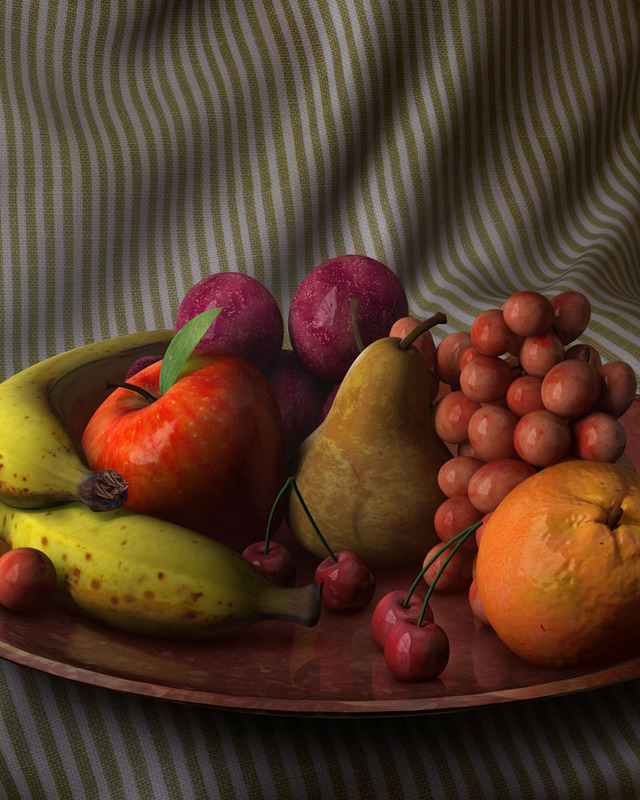 I have things broken out into passes rendered last night (I’ll post a breakdown when I’m done), so I’m thinking I’ll only need to render 2 more passes (a transparency mapped patch to cover the head of the banana, and a sss pass for the grapes) and do everything else in the comp. Some of the fruits that are going too reflective like the lower plum got brighter when I added the fog pass, and I am going to try to bring that back down in the comp. There’s also a reflection of a line (the edge of the cloth screen right), that’s also a bit hard on areas like the SR side of the plums, but I think weighting things between passes will help hide that. Jeremy, did you do any color correction ? I’d try to get away from the ‘neutral’ look you got now (colder key, warmer fills for interior-overcast look maybe). And since it’s almost close-up, some very subtle DOF effect wouldn’t harm either. One last thing, the cropping is a bit distracting, - eye is drawn to the edges of image (mostly left one, additionally the rim on the banana leads out of the image). Some more defined focus point in the middle part of the image should fix that. http://www.pbrt.org/, but I’m sure there’s others around too. Correct me if I’m wrong though. I don’t think there’s any renderer that captures the entire spectrum or light interactions we have in real life - it’s just by far too complex, and the approximations we have so far look good enough for most purposes. And if there is, its render times would be far beyond usable for use outside research - there is a reason why all the renderers we use stick to stochastic BSDFs and don’t render individual microfacets. Thanks for the crit Jeremy. I didn’t notice the bump on the apple before, now it sticks out whenever I look at it! Heheh, I’ll have to fix that later on tonight. The render you posted is looking very good. I love the plate material with the flakes and the pear, they’re both spot on. But the only crit I have is with apple. For me, the apple looks to orange in colour and it doesn’t have that “sheen” from the wax that most apples have on it. I’m interested to see the breakdown of your image as well. Great work man. Doh… I do need to get that book now, where’s my amazon account…? Anyway, the 300 Tflop/s quantum particle accelerator (running on imitation diamond basis) in my basement is just waiting for these renderers. Nice render, I like the banana, the most realistic here. I still dont like the texture of the pear, it looks stretched so far. Looking forward to see more. Thanks. Only 1 more. Tired. I fixed the pear a bit, but it’s a funny projection around a polygon mesh and it’s not going to get a lot better. Only major thing here is I tried to separate the orange from the grapes more, they were all running together in the last comp. I’ll guess we’re all ready for the next challenge. An other render I did… I won’t stop now. I saw this challenge a little bit late... :sad: Congrats to everyone. I've seen great inputs. I've used 5 lights (3 point setup, top light and another one for some highlights). No GI. No image filters. Render time was 2-3 min. some other little tweaks. Procedurals and gradients. No image maps. That’s great! The rectangle of light is just a perfect pool there, it nails the composition, makes the image more interesting, and still looks believable. I think the highlight on the pear is spot-on, it just sells me that this is a pear. In the apple highlight, it seems as if the dots inside the highlight are going too dark, and the cherry highlights look too bold (if the cherries were that shiney I’d expect a reflection of that light shape and texture more) The cloth is looking great, although parts of it screen-right look a little bump mapped. I saw this challenge a little bit late… :sad: Congrats to everyone. I’ve seen great inputs. I’ve used 5 lights (3 point setup, top light and another one for some highlights). No GI. What I find interesting in this image is the grapes. The SSS effect is very subtle, but looks natural and balanced with lighting levels. Is not an easy task to get SSS effect on dark surfaces. Well done Jacobo. Thanks for your feedback Gerardo! I appreciate your comments. I’ve use a gradient in translucency channel for the SSS graps effect. (intensity, color, position and orientation) until get that effect. My name is Lisa Kelly and I am a product specialist at Side Effects Software. I wanted to post an entry to the challenge using our 3D animation software Houdini and it’s Mantra renderer. While I didn’t get as far as I had hoped, this entry gives you an idea of what I was able to do in Houdini. There are nine lights in the scene although the mood isn’t quite what I was aiming for. In case you would like to see how the Houdini shaders work, I have  posted my Houdini scene file at [www.sidefx.com](http://www.sidefx.com/) in the Houdini Exchange which can be found under the Learning menu. You can download the file and use our free Apprentice edition to explore the file. Please feel free to tweak the shaders and render out your own compositions. The Apprentice Edition uses a small wordmark and is limited to 640x480. I thoroughly enjoyed this challenge and look forward to doing more!! Here is my try (hope it’s not too late). nice work. keep on ! !